Meet my Diamond Python - every house should have one! Diamond Pythons are found all along the New South Wales coastline down into the north-eastern corner of Victoria, and west into the Blue Mountains. Photos: Lisa Herbert. 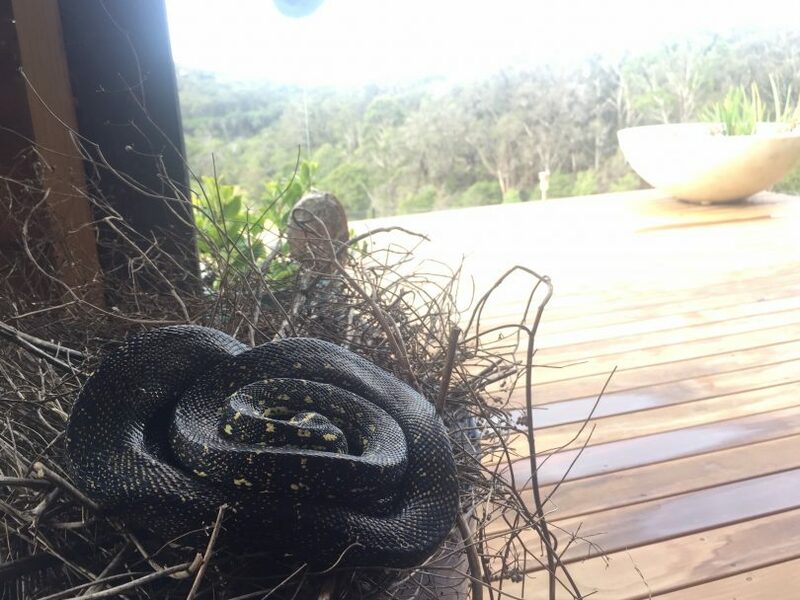 Last March she lived for a few weeks curled around the joists of my deck at home in the Bega Valley. I had no indoor mice or bush rats last winter, which I attribute to her efficient nocturnal hunting. I was sad when I hadn’t seen her around this year, then three days ago she turned up, again wound around the joists under my deck. But it’s been raining heavily for over fourteen hours, and this morning she surprised me – I found her coiled around herself in my coriander seed bucket. And there she has stayed all day, eyes closed, snoozing. Once she’s had her pre-winter fill of the little rats, microbats and other creatures I hear racing around on my deck each night, I think she’ll move on and seek a quiet spot for her winter nap. Diamond Pythons are found all along the New South Wales coastline down into the north-eastern corner of Victoria, and west into the Blue Mountains. They’re frequently spotted in homes that border bushland, like mine. Like all pythons, these beautiful snakes are non-venomous. 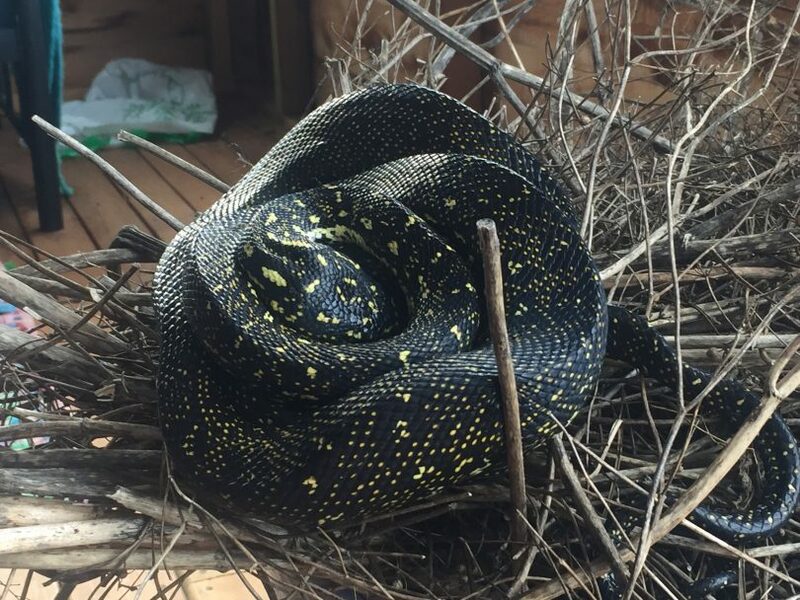 They’re related to the Carpet Python and even interbreed with them where their territories overlap (Carpet Pythons are more northern, starting around Newcastle). Diamond Pythons are most active in November, as they move around looking for mates and laying eggs. A male can travel up to 500 metres a day following the scent-trail left by a female when she is ready for a mate. From November to December she will lay up to 30 eggs which she curls around to protect from predators, also creating heat for their incubation. 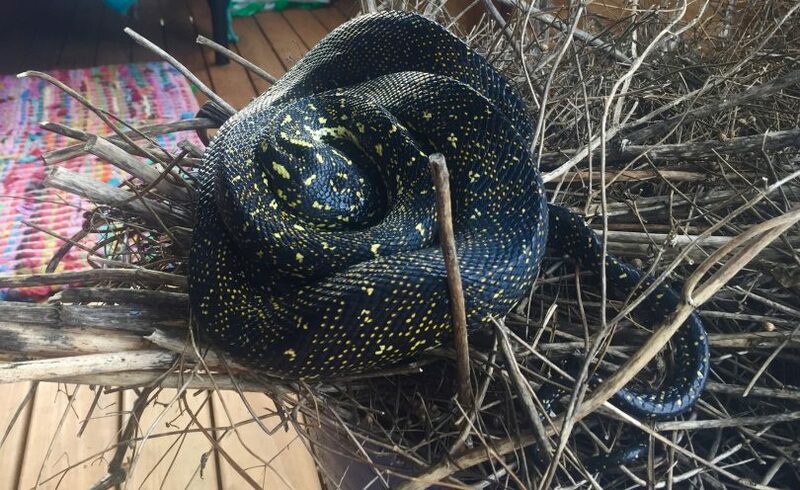 Apparently, this is unusually maternal for a snake. She’s an ambush predator and will often wait for days until a small animal gets close enough for her to strike out and grab it. She then squeezes her prey until it suffocates and only then swallows it whole, head first. So perhaps my Diamond Python is also humane. She is the reason I don’t put poison-baits out around my house or shed. 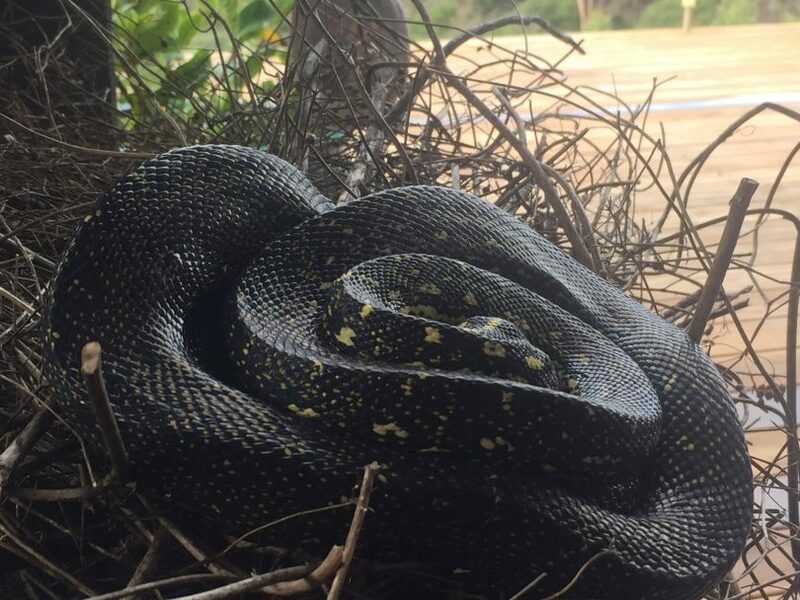 The Diamond Python will typically remain in one position for up to two weeks, before moving to another, perhaps only 100 metres away. Within their own territories, Diamond Pythons are always on the move. They move around seasonally to occupy well-camouflaged positions in the warmer months and they brumate in the winter months – napping, but occasionally out and about seeking water. The females have a range of up to 50 ha (120 acres), and males may occupy an area almost twice as large. They live up to 20 years so if you spot one more than once in the same area, even years apart, it could be the same creature. My girl is incredible to watch. Though she doesn’t move often, when she does, she is graceful and fluid. More so than the enormous, floppy-footed goanna (Lace Monitor) that also hangs around my back door, testing the ground with his long, white, forked tongue, searching for something I may have dropped on the way to feed my (sometimes) nervous chickens. There is no reason to remove these pythons or be afraid of them. As well as being non-venomous, the Diamond Python is one of the most placid snakes in Australia. They will rarely hiss or threaten people. And as they’re great pest controllers, why would you want them gone? My Diamond Python has never hissed at me. She’s a calming creature, and I think I’m a little bit in (symbiotic) love.